So glad It Is Wednesday! YOU MADE IT HALF WAY THROUGH THE WEEK! Now it’s time to relax, and meet some new bloggers! 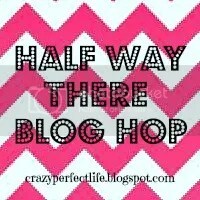 Welcome to the fourth Half Way There Blog Hop! Join in! Find some new blogger, check out their post, leave some comments, and make new friends! Every week, We will pick a new Co-host to help us out! email me to kara(dot)schwieterman(at)gmail(dot)com for consideration! -Visit meet, and comment on other blogs! – Grab our button, and share this awesome Blog Hop! – Don’t forget to e-mail me for a chance to be a Co-Host for next week! Link up your blog to meet new friends!! Add me on instagram & twitter, & I will be sure to do the favor back! !